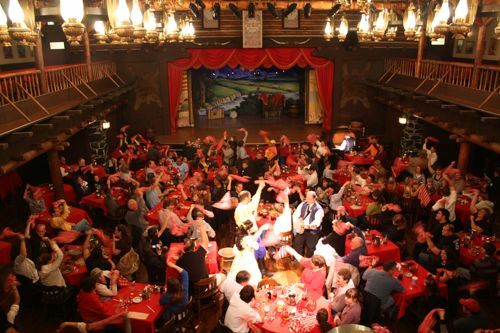 The Hoop-Dee-Doo Musical Revue is a fun, rollicking, Western-themed vaudeville dinner show. It takes place in Pioneer Hall located in Fort Wilderness. (Since this resort restricts vehicular traffic, extra travel time is needed.) Pioneer Hall has the main floor and a balcony. Seating is pre-assigned. Dinner is served family style and includes a Dinner Salad, buckets of Barbecue Spare Ribs and Fried Chicken, Corn, Baked Beans, and Strawberry Shortcake. Unlimited Soft Drinks, Coffee, Tea, Milk, Beer, Wine, and Sangria are included. Guests requiring wheelchair access may only be seated in category 1. Categories 2 and 3 may require ascending a flight of stairs. This dinner show can be booked by calling (407) WDW-DINE. There are currently 22 reviews for Hoop-Dee-Doo Musical Revue. 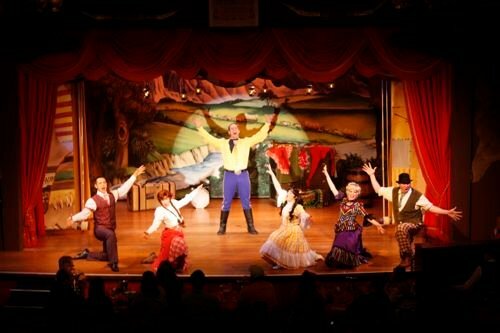 Read Full Hoop-Dee-Doo Musical Revue Reviews! You can also search for Hoop-Dee-Doo Musical Revue specific threads! All menu items/prices are subject to change. Last updated 01/10/2019.